River Brass - What is a brass band? The tradition of brass bands began in the UK in the early 1800s. Community bands were formed and became quickly popular, spreading across the globe. The brass band tradition hit the United States in the late 19th century while maintaining the original setup of the British style brass band. Most towns had their own band and even some large factories had bands. Popularity began to decline in the early 1900s but the tradition did not die out. As of recent years, many new bands (including BRBB) have started up as a revival of the tradition. What makes the band British style? It is important to note that the British brass band is very different than the American brass band. British bands use instruments rarely seen in the states, which is one reason such bands are becoming harder to find here. American bands use well known instrumentation of trumpets, French horns, trombones, baritones/euphoniums, tubas, and percussion, but the Brits take a different approach. The next section will outline each instrument used in the British brass band. The Bb cornet is the British replacement for the trumpet. The difference between the trumpet and the cornet is that the trumpet has a cylindrical bore while the cornet gradually tapers the entire pipe. This results in a slightly more mellow sound without the brightness and edge of a trumpet. There are typically around 9 cornets in the band. In the standard literature, there will be three to four cornets covering the solo cornet part in the front row. The back row will have about 2 players each on second and third cornet parts. In addition, another cornet labeled "repiano cornet" is used. The function of the repiano cornet is diverse, as it frequently doubles with the flugelhorn or the solo cornets but also has solo passages that are completely different than what the rest of the cornets are playing. The repiano cornet is not a different instrument...it is just a cornet playing a special part. The Eb soprano cornet is the smallest and highest pitched instrument in the band. As the only soprano cornet in the band, its voice carries very well over the rest of the cornet section. It is pitched a fourth higher than the Bb cornet. The soprano cornet is frequently used to cover flute and piccolo parts for songs that are transcribed for brass band. It can be one of the most physically demanding instruments in the band to play. The flugelhorn is another instrument that has a very unique role. There is usually one flugelhorn in the band. While it is the same length as the Bb cornet (therefore having the same range), the flugelhorn has a much wider bore which adds a very rich mellow sound. Typically the flugelhorn will play parts bridging the gap between the third cornets and the Eb alto horns but it also plays a frequent solo role in the band due to its beautiful tone. The flugelhorn and repiano cornet parts are often printed on the same page because the two play together a lot. Some flugelhorns are equipped with a fourth valve to play lower. The Eb alto horn is perhaps one of the unrecognizable instruments to most Americans because the British brass band is the only setting that they are used in here. (It is referred to as an alto horn in the US but a tenor horn in the UK, while the US frequently refers to baritones as tenor horns.) The alto horn looks like a small baritone horn. Typically, there are three alto horns in the British style brass band: solo, first and second. The alto horns provide the mid-voice that the French horns would typically provide in an American brass band. The baritone horn appears to be the older brother of the alto horn. It is pitched a fourth lower than the alto horn and two of them are used; one on first and one on second. It is not to be confused with the euphonium! 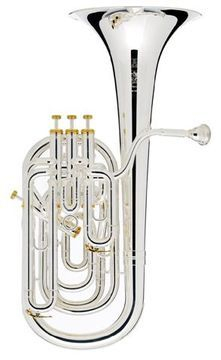 The baritone has a conical bore that is a lot narrower than the euphonium so it has a brighter tone to it. There are two euphoniums used in the brass band that sit alongside the two baritones. They each cover a different part, labeled first and second. 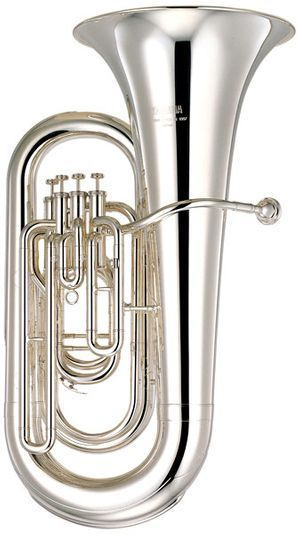 While the baritone and euphonium are the same length of tubing, the euphonium has a noticeably larger bore at the throat of the bell so the sound it produces is much deeper and more mellow than the baritone. Some euphoniums are equipped with a fourth valve to play lower. Everybody recognizes the trombone! It is one of the few standard American instruments used in the British style band. There are typically 2 tenor trombones in the band, playing first and second parts. It may seem surprising, however, that the trombone parts in British brass band literature are written in treble clef rather than bass! This can be a challenge to the new brass-bander. Some trombones are equipped with a thumb trigger to play lower. The bass trombone is the only horn in the band that reads off of the bass clef! It is equipped with two triggers to enable it to play the lower notes in the trombone section. It has a bigger bell and a wider bore than a tenor trombone. Only one bass trombone is used in the brass band. Eb tubas are another one of the "hard-to-find-in-America"instruments. They are pitched in between the euphoniums and the Bb tubas, providing the upper end of the bass register. Most of the time they play the same as the Bb tubas, but frequently double in octaves or add fifths to the bass note. The tone of the Eb tuba is unusually and mellow compared to the Bb tuba due to the very large bell which gives it a good solo voice (as often as tubas get solos, that is!). There are two Eb tubas in the band, and they frequently play divided parts. The Eb tubas also read off of the treble clef. The Bb tuba is the granddaddy of the brass band. It plays the lowest parts. Two Bb tubas are used in addition to two Eb tubas. The two Bb tubas typically play the same thing most of the time, but have occasional divided parts. The Bb tuba is the standard tuba in American bands. It may be surprising that the lowest voice in the band still reads off of treble clef. This enables other members of the band to substitute on any valved instrument and still play the same fingerings for each horn without learning another clef. Of course, a brass band is not complete without percussion! Percussion in the brass band varies a lot, ranging from snare drum, bass drum, cymbals, triangle, mallet percussion, and timpani. You name it, and the band probably uses it at some point.